Two of my recent stamps resonates nicely to the eternal them of love and death. 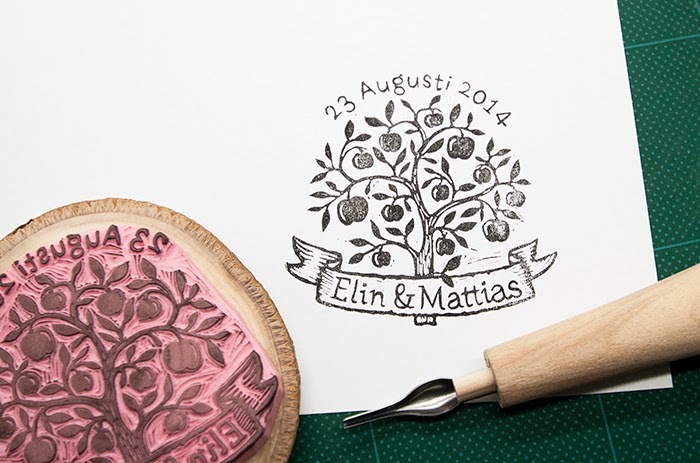 The first is one for Elin and Mattias, a couple about to get married in a little cafe here in Sweden famous for its apples. I made the whole stamp with the small gouge - except for the date on top, which I made with a scalpel -because I want to keep the stamp nice and textured. And the second stamp is a wife's present to her husband's business. She requested a skull stamp. I asked about the style she was looking for - more cartoony, or something on the dark side? To which she replied, oh, of course, dark. That's how this awesome stamp came into being. Gouge for the skull and scalpel for the texts. Hy Tyr! I just wonder how you can work so detailed on those small letters with a scalpel. Unbelievable! Hey you! Do you know if the one you use if sharp enough? That might be the problem.